One of the substitutes for eggs in baking is a mashed banana. 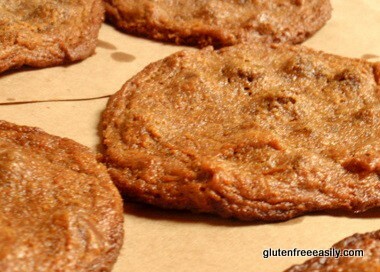 I’ve wanted to make an egg-free version of my Flourless Peanut Butter Cookies for some time. But this time substituting a medium ripe banana for the egg and mixing it with creamy almond butter instead of peanut butter, plus adding the little bit of vanilla and baking soda, and a fair amount of Enjoy Life Mini Chocolate Chips yielded some wonderfully good Flourless Banana Almond Butter Chocolate Chip Cookies. This photo is not a prizewinner by any means, but these cookies sure are. At least in my opinion. Don’t let the flat appearance of these cookies fool you; these are not thin crisp discs. They are the perfect type of cookie—that wonderful combination of soft and chewy. Those of you who think that there’s nothing better than peanut butter, banana, and chocolate will want to make this recipe using peanut butter as your nut butter. I’ll try that next time myself! In large bowl, mix all ingredients together well. Drop heaping tablespoonfuls onto ungreased baking sheet. Bake for about 8 to 10 minutes. Leave cookies on baking sheet for about 10 minutes as they continue to bake/set up. Remove to cool. Using a "medium ripe" banana adds more structure to the cookie. Also, be sure not to over mash the banana. You should still have tiny chunks of banana after mashing; it will not be a puree that has an even consistency throughout. See reader comments on how less sweetener and different sweeteners have been used successfully in this recipe. You will probably want to remove cookies from oven when middles look firm but not quite done; otherwise, cookies may overcook slightly on the bottom. I still get an occasional paper bag at the grocery store, just for cooling cookies. The inside of the paper bag helps absorb some of the extra grease from the nut butter, but paper towels would work, too. This post is linked to Gluten-Free Wednesdays, Allergy-Free Wednesday, and Wellness Weekend. Awesome! I LOVE almond butter and mashed bananas just on their own!!! As a cookie this recipe will be hugely popular in our household and it’s so simple to make! If I use honey instead of sugar (and leave out the choc chips), these cookies would probably be a great SCD treat! (though we’re supposed to only use VERY ripe bananas). I’m sure it would still work with a little tweaking of the quantities! BTW those of us here who are just gluten-free and not following the SCD can of course enjoy the choc chips as well!! Hi Vicky–I hope you guys really enjoy your SCD version of these. 🙂 As we’re a beekeeping family, I always want to know when honey works in a recipe and what other changes were made to accommodate the honey. Yes, I do know that SCD requires very ripe bananas so, yes, something will need to be tweaked to provide more structure since the banana won’t be doing that. Hi there. Lovely looking cookies! I found you on Kalyn’s site. I too am a GF cook. I take it one step further and low carb too due to several health issues such as pre-diabetes and breast cancer but can’t wait to read more of your blog and get to know you!! Oh my, these sound so good –with a nice round up of some of my favorite ingredients. I have a little buddy who is nut-free and egg free, so these could be perfect! Hi Debbie–I think any fruit puree with a similar thickness/consistency to mashed bananas would work. I wouldn’t recommend applesauce unless one had a homemade super chunky version, and I’m not sure about the flavor combo there. 😉 Prunes or dates might work well. 🙂 And you’re not rambling, dear … not at all. I love these conversations we can have in comments to help each other figure out “fixes”! Other ideas that come to mind for texture, but not necessarily the same taste of course are avocado, figs, and pumpkin. I know the latter is a favorite substitute of yours, and I loved the pumpkin butter chocolate chip bars I made back in the fall. Pumpkin butter would be awesome in these cookies and I *think* it would work like the banana does. 😉 Hope you can figure out something so you can enjoy this recipe, too, Debbie! Oh, no, Debbie! Not your beloved pumpkin! How about sweet potato? Not exactly the same as pumpkin, but close. Or maybe butternut squash? Hmmm, there always has to be a solution, right? You never ramble, Debbie. Between the two of us, it’s me who is the rambler. 😉 True. I use ground flax seed as an egg substitute 1TBL of Flax to 3TBL warm water. It works great. I’ve also used banana and applesauce…sometimes I combine all of them! These cookies sound so good, I want some coffee now to go with them! Thank you for sharing, I will try them soon! These sound delicious, Shirley! Thank you for sharing. These cookies sound incredible Shirley! I love the combination of flavors. Yum! Thank you, Andrea! I think I hit gold with these … banana gold … nut butter gold … 😉 I hope you enjoy them! Those look yummo Shirley! 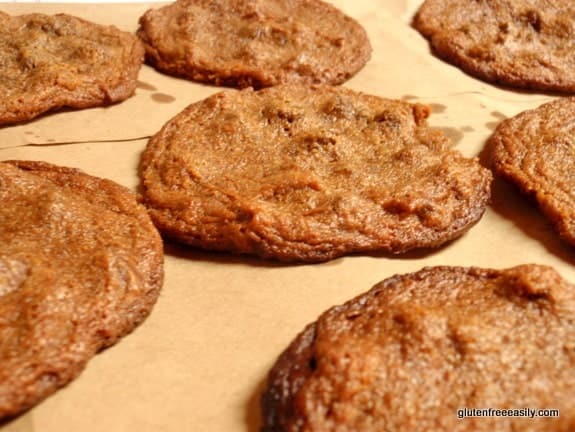 I love using banana as an egg replacer in cookies – just a little works great! Alisa–I’ve only used banana as egg replacer a couple of times, but it has worked well when I have! I actually made this recipe once with no egg and it worked perfectly, but then I could never duplicate those results. I suspect that the fact that it worked the one time had to do with the texture/moisture content of the brown sugar. You know how sometimes it really binds well (usually true of brown sugar one has had a while and which has lost a lot of its moisture) and other times it’s more granulated? So until I figure out how to get the perfect brown sugar for egg-free baking in these flourless nut butter cookie recipes, I need to come up with some other alternatives. 😉 Would be fun to see if I could make these when camping, baking them in the campfire somehow! ever since I went TJ’s organic brown sugar, there has been no looking back. Haven’t bought another brand in years. I suppose the other organic brown sugars might be similar. However, it is higher moisture, and I haven’t had a problem .. but I always reduce the fat when baking dairy-free and egg-free, otherwise it is problematic. Alisa–All that is good to know–thanks! Still pining for a Trader Joe’s in our area. Each year our local newspaper polls readers on which stores we want most and Trader Joe’s is always #1. There are stores north and south, each a little over an hour away. 🙁 One day maybe! These look wonderful Shirley, definitely plan to surprise Luke with them for breakfast tomorrow morning (only we’re back to carob for the time being, boo)! Hi Jenn–Thanks so much, dear! I hope he does love these cookies. 🙂 I was actually thinking of you today as I’m planning to do some baking with chestnut flour and I know you’ve used it successfully. Shirley, these look awesome! I happen to have 2 (yes, 2) bunches of bananas at the moment. Jeff and I are both racing on Sunday, so these are looking like the perfect treat for this weekend! Ah, I wish he could block the wind for me in the race! Women are a separate category. I’m on my own. And I highly doubt I’ll find a 6’5″ female to hide behind 😉 I’ll let you know how it goes! I will absolutely be taking these to the race for a post race treat. Your last cookie recipe I tried was such a hit. That deconstructed Samoa didn’t last long in our house. This one looks like it would be the same. Goodness me, that sounds interesting! If you say it is good, that is good enough for me, you know I trust you! Your burgers sound wicked awesome! Absolutely brilliant Shirley. I’m going to make these for dessert tonight. Great ingredients! Shirley – I love this recipe! What a great idea to use a banana instead of eggs, and with a nut butter and chocolate chips – so delicious! These cookies are making my mouth water…I want some now! Yum! My daughter just loves the other cookie, but I’m going to change her mind and favourites with these for sure! Yum! These look fabulous! Love that they are flourless and still pack in so many nutrients! These look good, Shirley. I’m headed out to the health food store soon and have almond butter on my list! I like the use of bananas and chocolate chips. I might try it with an egg though. Shirley – these look crisp. Please tell me they are. I will make a beeline for the kitchen and make them. Well, then again, I’ll wait until tomorrow:). Ellen–You did what I’m often guilty of … you “skimmed.” 😉 If you read the post, you’ll see that I say that although these cookie look crisp, they are not. These are soft and chewy cookies. Sorry, Ellen. 🙁 Will give you a heads up when I create my next crisp cookie recipe though! These look amazing, Shirley! I would have never thought to do this, but I’m so happy that these turned out as every time I combine bananas and almond flour, it refuses to set. Any suggestions? Hi Christine–Thanks! 🙂 Well, in this case, it’s almond butter and banana. The almond butter has the critical “fat” and natural binding much more so than almond flour. I’m assuming that you’re talking about combining bananas and almond flour without eggs for a vegan recipe. Is that correct? I’ve done that using flax eggs before and I know chia eggs work, too, but you definitely need something with fat and binding abilities. I’m sure you’ll come up with a successful recipe using these ingredients soon! Shirley, these sounds so perfect. And so dang simple to throw together!! This would be a perfect after school treat for the kids and I to put together this afternoon!! And so jealous of your lunch with Diane!! So glad you were able to enjoy such a yummy meal. I miss you two so so much!! oh, Shirley.. these are yummy! Just got done making them, using Sun Butter… awesome to have a recipe that is good for everyone in the house! 🙂 Thank you so much for sharing this one.. will be used over and over from now on! The kids really love these! Thank you! *I’ve made them twice, the first time I cut the sugar in half (used 1/2 cup). *The second time I used 1/4 cup sugar (just right for us). *I skipped the chocolate chips (my son doesn’t eat chocolate so I just left it out). *About 4 minutes into baking I pat them down into flat cookies, and bake for a remaining 7 minutes. *I allow these to cool on the nonstick baking mat, then slide them onto a plate and transfer into the freezer for about an hour. This keeps them together very nicely – so chewy and delicious. Thank you for a great recipe Shirley! Keep ‘um coming! Thank you SO MUCH, again,for the coconut sugar!! I just recieved it in the mail on Saturday. I am so excited to bake with it! I found 2 recipes to try:D Thank you for doing the giveaways! I love the texture on these! these do look sinful without any of the bad stuff in them! These are delicious. I also added 1/2 Gluten Free oatmeal, which was even better. My family ate them up in one day. Thanks for sharing this recipe! These are really good but too sweet – because of the banana, I think less brown sugar can be used. Otherwise an amazingly excellent and simple recipe, thank you for posting! Shirley I just made this recipe today … as it looked so good and the ingredients were perfect. I don’t know what happened though as my dough was very soft and the cookies went totally flat when baked. There was no texture to them … And I even added about a 1/2 cup of almond flour when I saw the dough was so runny. Any suggestions? They taste good but look terrible. Hi Saundra–Oh no, on your cookies not turning out well. 🙁 These cookies are flat and soft, but “no texture” doesn’t sound right. I suppose the results could vary dependent upon the almond butter thickness/amount of oil or the banana ripeness. Not sure. You shouldn’t have to add anything to them. If I think of anything else that could have played a role, I’ll let you know. I’m so sorry they didn’t work out well for you! I never, ever comment on blogs, but I just made these cookies and they are wonderful! I made a slightly different version – tahini instead if peanut butter, added about a scant two Tbs of sesame seeds, and reduced the sugar by about half. They are so good! I am transitioning to grain-free eating and am finding many baked goods rely on lots of eggs and result in an almost soufflé texture – not what I want in a cookie! These are perfect and chewy. One note: my dough really spread and ended up giving me one giant cookie, I think because of my substitutions. 🙂 Next time I will give them more space! These are delicious! Ill cut the sugar in half next time 🙂 i used peanut butter. Just made these..oh boy! Couldn’t believe how much they puffed up, but went flat when I took them out. Made them with p butter. I think next time I’ll make them a bit smaller, because they really spread & they’re a bit fragile. Make sure they have COMPLETELY cooled before you touch them. Yummyness! No, they’re not pretty, but who cares…they taste great! Thanks Shirley! Thanks so much for reporting back! These are great! So delicious! I made them for my grandma who is gluten free…she was supposed to come over for coffee but had to cancel…my 2 year old and I devoured these cookies in a day! haha they’re going to become a staple cookie in this house now!